Numerous types: Bullaces, Cherry Plums, Damsons (including the Shropshire Damson), Gages, Mirabelles, Plums; Cooking & Dessert. Bullaces - used for cooking, has a sharp taste, not sweet; not recommended much nowadays but those who acquire the taste love them. Cherry Plums - often used as a flowering tree or hedging; small fruit produced in July which can be used for pies or jam. Damsons - intense spicy sharp taste - despite stories to the contrary - can be eaten uncooked, particularly the Shropshire Damson. Excellent for cooking, jam and wine-making. Easier to grow than a plum. Mirabelles - small, yellow and moderately sweet. Plums, Cooking - hardier than the dessert plum. Heights can vary, 10' to 30', depending on type and whether dwarfing rootstock is used. Advisable to buy a 2-3 year-old tree. Forms include: bush, fan, standard and half-standard. Some are self-fertile but others will need pollination partners unless you live in a plum-growing area. Avoid pruning in winter, some are suspectible to silver leaf disease. Young trees can be pruned/trained at the end of March, older trees in June/July. Minimum pruning is need with older trees, only cut out damaged or diseased wood, overcrowded branches. Birds can be a major problem, fruit buds in spring and the fruit in autumn. Silver leaf: spores enter through wounds in bark, leaves silver, shoots die back, wood becomes stained. Cut out and destroy affected branches. If there is no wood staining then it is likely to be false silver leaf - need to feed and water regularly. If bracket fungi starts to appear on trunk - tree has probably had it! Abundant crops may need to be thinned. 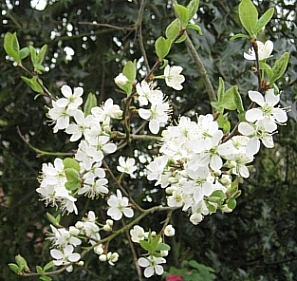 Large numbers of damson trees are found growing 'wild' in the hedgerows around Wem. Damsons were a major source of dye before synthetic dyes were developed just after WWII. The damsons would be collected from around Wem and sent via the railways to the dye manufactureres in places such as Manchester.